Replies: 110 (Who? ), Viewed: 125279 times. Is it possible to use the WA basement tool to make basements that can be walked into from outside without having to go downstairs? I think the answer is probably "no" because of how the basement tool works, but there might be some cheat or hack that allows it. 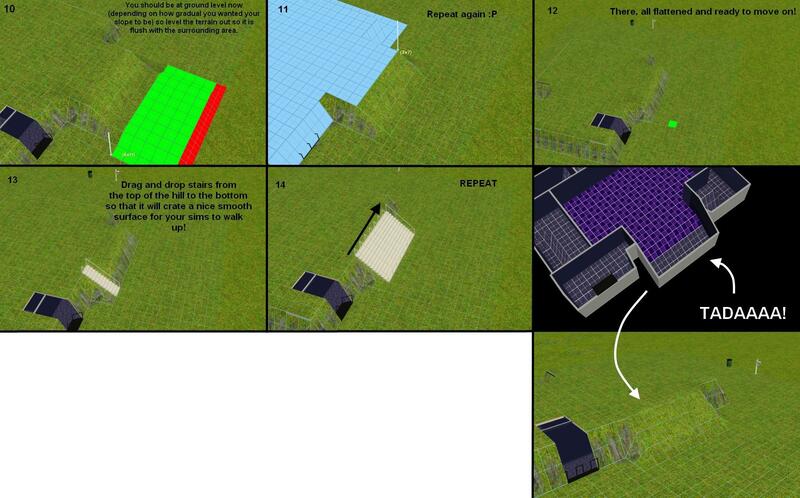 The main reason I want to do this is because I find the "old"/Sims 2 method of building basements annoying. 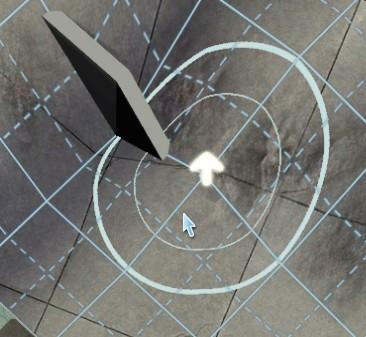 I really don't like having walls that aren't real walls and can only have objects placed on them via moveobjects on. I also don't like having to use foundation for houses because of the extra routing involved. Hmm, I haven't tried this but theoretically it should be. 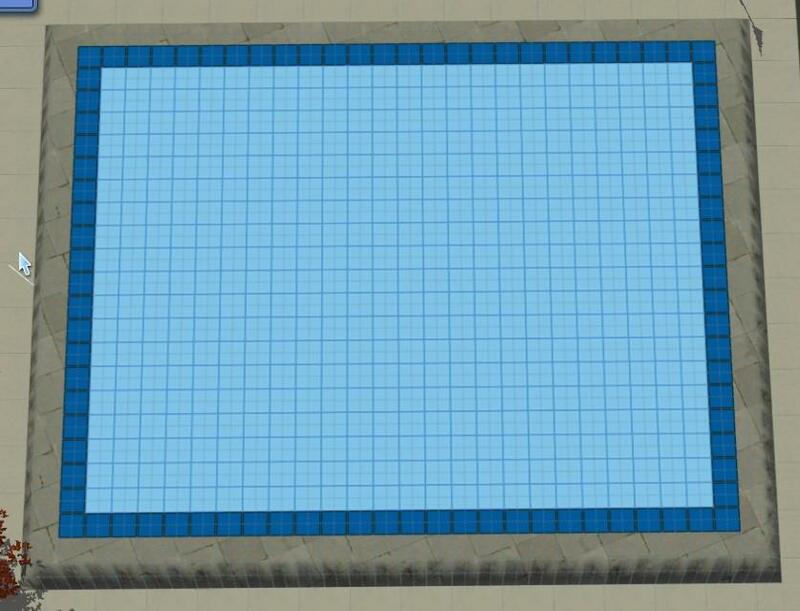 We can place windows in pool walls now, so it may be possible to place a door in the same way. 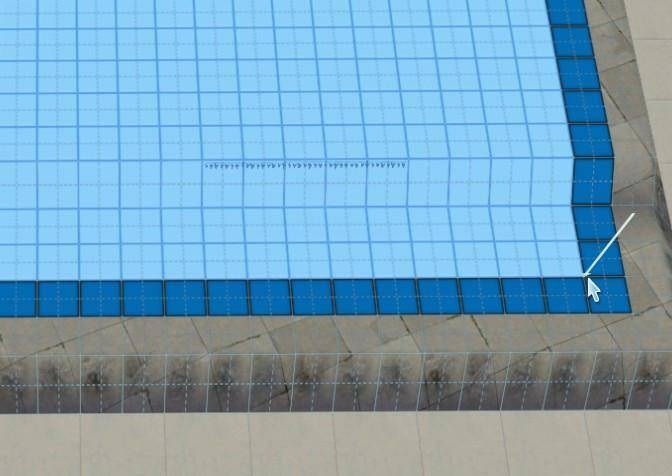 Then delete pool and lower ground to expose basement wall. Worth trying? Well, I've discovered that it's possible to place windows in a basement wall using moveobjects on. And if you dig away ground from outside the basement, these windows are functional and let light in. 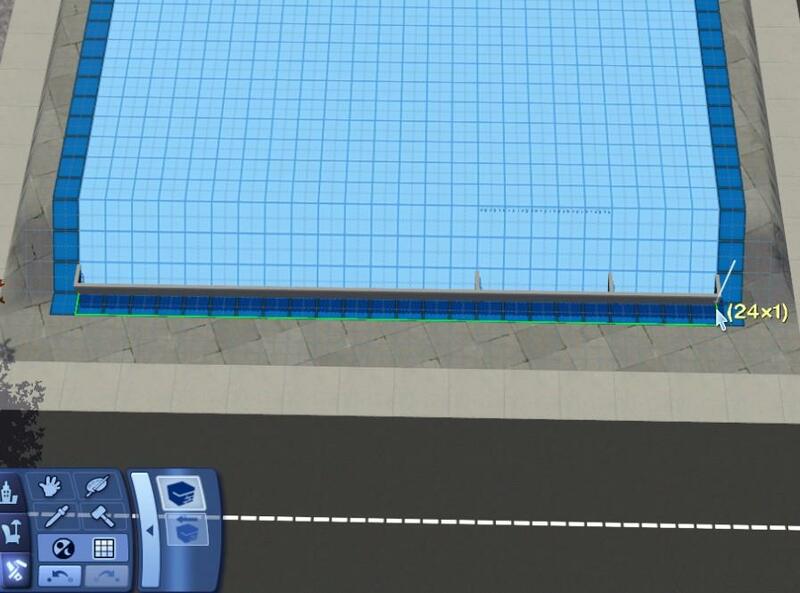 However, it is not possible to place a functioning door in either a pool wall, or an external basement wall, because the game simply isn't expecting a door to be there. So a hole isn't cut in the wall for the door, meaning it looks terrible on one side where it's sunk into the wall. I didn't try to see whether sims could use it - I'm suspecting not. Yes it is. You can see it on this site for example. That strange modern house is really nice, but after some thought and fiddling I think it was made as a normal house with a grass texture on the roof. Perhaps the two sides where sims can walk up to the roof were made using the basement tool and constrainfloorelevation false? The area underneath them is not part of the house itself, so it could be a non-functioning "basement" on the same level as the rest of the house. I've found that it's possible to make a basement on the same level as ordinary walls - the difficulty is in joining the ordinary walls to the basement and allowing access to both halves, seeing as doors in exterior basement walls are non-functional. When I've sorted out my current house problem I'll try to make a house in that style, and if it works, take photos for a tutorial. That house is made with cfe cheat and stairs. Stairs "into" the "basement" limit the "ground". 3 clicks make a wall. I saw a tool made by someone, was it flabalkidiki, hopeless name lol. I think he made something for leaning walls like those at the end. Might be done with cfe too. Hm stairs? intersting. Flabaliki made a cc fence that goes into the ground rather than above, which can create retaining walls, it's not a tool. And, yea, that house is made with the cfe cheat and basements. Normal walls cannot be made flush with the ground so that ramp from ground level up is the basement walls. So you then make the normal walls and basement walls connect, or do you put doors into the basement walls? So was I right to think the ramps are basement walls, shaped with cfe, and the rest of the house uses normal walls, with a grass texture on a flat roof? There's that telltale line at the top of the ramp that shows the top of the basement wall. I would have to test this myself. I would start by shaping the landscape so you you can have regular walls continuing from the basement. Putting the basement in an elevated area. Putting in walls in 1 end and pressing down with cfe in the other end, would be a lot of fiddling I'm sure. Baratron, it's made with the basement tool, you can probably download that house, and other similar houses here: http://www.thesims3.com/myBlog.html?persona=Domangcop. The grass on top of the house is real grass, and sims can walk on it. The top of the basement wall always show if you lower the ground next to it, I think. That would explain the line you're talking about. I must say that Domangcop is very clever! I have been trying to reverse-engineer what (s)he has done, with some success, but I'm stuck on one part. The whole lot is created by making a huge square basement, and drawing the shape of the house with internal walls. So, the ramp walls and the walls with the windows and doors in are actually normal walls, built inside the basement. The way you get the cut out ground is to make the internal walls higher then the ground using the CFE cheat, and then setting some staircases into the basement. The hole created for the stairs is what gives the nice sharp hole, which will leave the walls exposed but the grass on the roof. The ground moves but the walls don't! The only way I can shift the ground at basement level is to click-drag with the level tool, it seemed to work at first (I managed to raise the central walls to a different height) but will not work now. Does anyone have any ideas to get that beautiful flat slope? You could try putting floortiles around the walls. I had this a few times when I was testing my latest house, it seemed to work. Also, placing floortiles on top of the walls could help. I used the CFE cheat quite a lot, had loads of problems with it. Let me know if it actually helps, because it has been some months now since I last had that problem. Last edited by MisaMii : 25th Jan 2011 at 9:58 PM. Thank you for the tips, MisaMii- I will try these later. 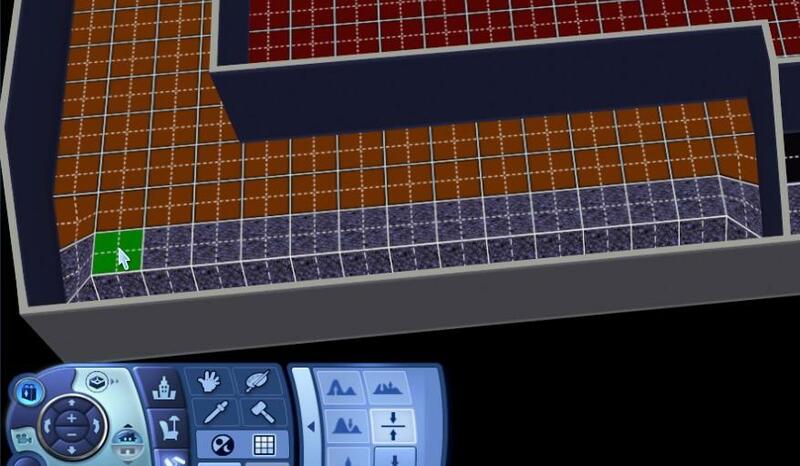 *pokes Simsample* I know how to slope basements! While I may be no help in CAW, building is my forte, for sure Took pictures, because it was way easier than trying to explain it. I couldn't figure out how to go about doing anything else with this technique. I hope you figure it all out and write up a nice tutorial on how to do it, I can't wait to make a house using this cool trick! I keep getting stuck on how to get the terrain above the stairs to go away. I am trying to study the house and your pictures, but I can't get it quite right. Also, I am trying to work on a way of getting the walls of the basement to shrink. Obviously the top carries no grid, so we can't adjust it from the top. But maybe we can adjust the height from the bottom upwards? That way there would only need to be one hole next to the sloped terrain rather than the current two. Looking for a challenge? Do you like to build, or do you want to expand your abilities? Look no further than this thread! Join the "Groundwork" foundation challenge today! But seriously, it will be fun. Join us. Last edited by QBUILDERZ : 26th Jan 2011 at 5:29 PM. Okay, this may be somewhat long winded, but I got stuck on some of the minuteai so hopefully this will help someone. Credits: This is a re-hash of the ideas QBUILDERZ came up with, and is based upon the original lot by Domangcop. The credit is all due to them! First, find your level. Click the stair tool on the ground to get a flat area, then build a wall on that. This is the level you need. Make your ground that height, so that a staircase goes down exactly 16 steps. Ground floor: the colours reflect what's under ground. Drag a basement from the flat area to the base of the slope you just made again. Don't go over the area you did previously- just go to the bottom of the new bit of sloped ground. You can see that now I have a sunken courtyard, and I can put doors and windows in there. I achieved that by placing pond around the edge and then dragging the level tool. Then I flattened the edges. 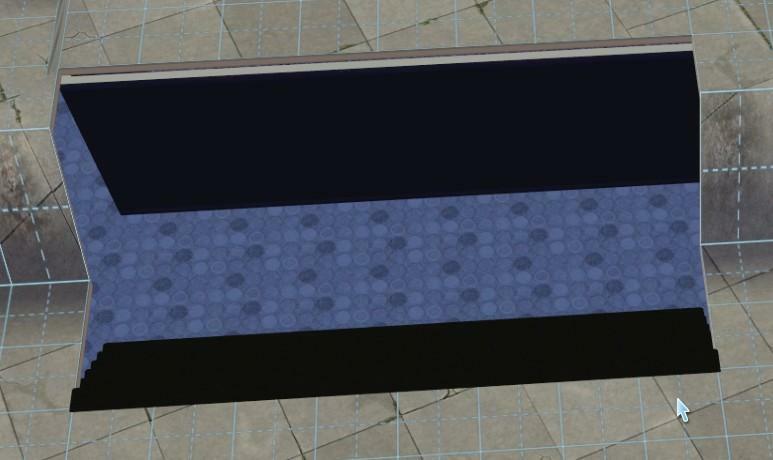 I'm thinking this could be good for making a rooftop car park- you are slightly limited with the slope though as you can only make a cutout of 4 squares long (the stair cutout length). Can anyone make any improvements to this tutorial or add any ideas? Please test it out for me and let me know if it is understandable. You could disguise the wonky floor by placing some plants, perhaps. Of flowers. Or a small fountain. Or the head side of a bed, like Domangcop did to cover up the wonky floor parts (then it'll kinda look like a half wall). This is really a great new way of building, will try it out in game when I have some spare time left. So, today is the third day this week that I am staying home sick (I went to school yesterday, hence why I didn't get to test this out and left a half-assed comment :P) and I intend on messing around with this today. I KNOW that I have somehow managed to reduce the height of besment walls before. If I can recreate it then I *think* that I might be able to make only one tile of warped terrain instead of 2. In my experience this kind of thing doesn't (always? ever?) work well when it comes to routing, so make sure you playtest before you put too much work in it. In a world I played recently, I had bunkers in hillsides built basically the same way (no screenshots but the entrances look similar to the bottom right corner of simsample's last pic) and sims weren't always able to get up the stairs that connect the sunken entrance to ground level. Once I tried manually and found that "Use Stairs" worked, but "Go Here" didn't (neither on nor off the lot). Getting down the stairs always worked as far as I've seen, just not up. That was in an 1.17.whatever game, so I dunno whether it works better/worse/differently meanwhile. I also use AM which appears to affect routing to some extent. I didn't notice any more issues after I had converted both bunkers to Community, no idea whether that was because the game treats sims differently on comm lots (or when they're on low res -- both bunkers are rather at the far edge of the map) or because the bunkers got used less often that way .. I don't think it was always a problem in the first place, only sometimes. I noticed it when another sim invited one of the bunker dwellers and they didn't show up, so I went to check what was up with them. I didn't look into this very closely, since the inhabitants were just game-generated bosses that I didn't care all that much about -- just saying that if one builds that kind of thing, one should make sure to playtest sooner rather than later to avoid frustration =). Thanks PBox- I will do some more testing on this, I was hoping to use a structure like this to make a community lot so routing will be critical. QBUILDERZ, I've edited my tutorial- I had a whole load of unnecessary steps in there so hopefully it's simpler now. OMG! How did you do that?!?!?! That is a WA basement wall right? Ok, I do realize what simsample is doing but isn't this different? Last edited by romagi : 28th Jan 2011 at 9:08 PM.